Last week I did a guest post for The Practically Speeching Blog on the topic of multiculturalism. In case you missed it, below I offer some suggestions on how to integrate multiculturalism into your group therapy sessions. I don’t know about you but I have a number of multicultural students on my caseload who exhibit language deficits in both their birth language as well as English. Even though I am unable to speak their languages (e.g., Spanish, Hindu) I still like to integrate various aspects of multiculturalism into my sessions in order to support their first language as well as educate them about their culture and other cultures around the world as much as possible. Why? Because among other benefits (e.g., cognitive, linguistic, academic, just to name a few) studies have also found a connection between bilingualism/multiculturalism and higher self-esteem in children (Verkuyten, 2009). For me the latter definitely plays a huge part, since children with language impairments already recognize that they are different from their peers when it comes to their abilities and accomplishments in the classroom, which is why I try to support them in any way that I can in this area. Believe it or not it’s not as complicated as it sounds, and with a little ingenuity you can make it happen as well. Below are some suggestions of what you can do in sessions. Let’s start with books. Even if you don’t speak the child’s language or speak it very limitedly, you can use books with a few words in another language. For example, to introduce just a few words in Spanish I have used books such as ‘Maňana Iguana’, or ‘Count on Culebra’, by Ann Whitford Paul, ‘Abuela’ by Arthur Doros or ‘Old man and his door’ by Gary Soto. If you speak the child’s language proficiently consider using bilingual books in therapy sessions. 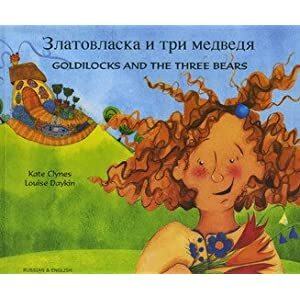 To illustrate, I have used bilingual Russian/English books such as ‘Goldilocks and the Three Bears’ by Kate Clynes or the ‘Giant Turnip’ by Henriette Barkow with a number of preschool and early elementary aged children. Moving on to apps, while a number of them come in different languages, I particularly enjoy those which introduce the learners to aspects of another culture. For example, “The Magnificent Traveling Palace” is one such app. It’s an interactive storybook about four children embarking upon an exciting adventure after boarding a luxury train in India. The book allows the readers to learn about India’s occupations, foods, as well as listen to some beautiful Indian music. Another interactive book app entitled: “Henrietta is Hungry” introduces learners to a little girl who is an adventurous cook and loves to cook exciting new foods. As Henrietta sails the world in search of that perfect dish, readers are introduced to a variety of exciting world cuisines (e.g. sushi, curried dahl, chow mien, chili crab, etc) and are even provided with a recipe (granted it is a chicken soup LOL) at the end of the story. To continue, I often like to integrate geography and social studies into my sessions. When I first started working with school aged language impaired children, I very quickly realized just how limited was their knowledge of the world beyond the “here and now”. Many twelve and thirteen year olds did not know such basics as naming the continents or listing a few countries of the world. So I found a number of apps and books to introduce these concepts to them constructively in my language sessions. I have used units such as “The Earth” and “Maps and Mapping” from Linguisystems’ 100% Curriculum Vocabulary Elementary to teach general concepts of geography, and app such as iLearn: Continents and Oceans to teach continent names and locations. Those of you, who don’t use ipad in therapy, don’t despair! You can use online geography games from Sheppard’s Software Website to teach concepts pertaining to both world and US geography. Even with some of my youngest clients (5+ years of age) I’ve used Social Studies Emergent Reader Series by Scholastic to talk about the counties of the world and the people who live there. We especially have fun when we are learning about all the cool holidays celebrated in other countries around the world such as Loy Krathong Day from Thailand, Diwali from India, White Day from Japan as well as many others. Of course not everything is one sided. I also expect my students to teach me about their culture, language, customs, and traditions by bringing in show and tell items, books, and even favorite recipes which we attempt to incorporate into our sessions. I really enjoy integrating aspects of multiculturalism into my sessions and I’d love for you to try it out as well. I guarantee you’ll have fun doing it! Previous post: To Speech Buddy or Not to Speech Buddy: That is the Question?